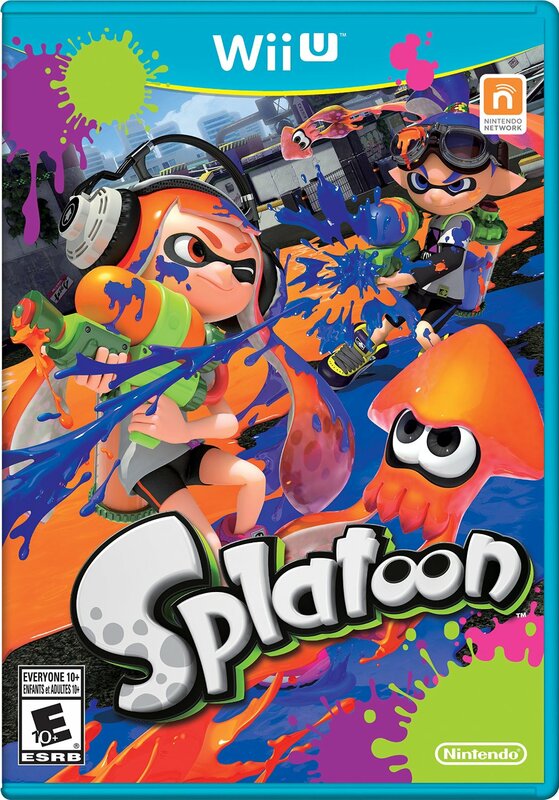 Splatoon is a third person multiplayer turf-war shooter from Nintendo. It’s the Big N’s first true attempt at an online shooter. The game was announced at E3 last year in 2014 and was made available for the masses less than a year later. There was definitely excitement and intrigue upon the games announcement. And that has carried over and multiplied until the release just this week. With much hype comes the chance for a big let-down, so Nintendo has to tread lightly. Nintendo is jumping into a whole new genre for them and a whole new franchise. There are two things that can always be predicted with a Nintendo game. It has the chance to have brand new revolutionary things that the world has never seen before. And it also has the chance to completely skip out on key features that other games have nailed down for years. As a Nintendo fan, I always hope for that first thing and fear the latter. Splatoon’s second-to-second gameplay is incredible. It provides some of the most fun online shooting I’ve ever had a chance to play. You play as a squid kid, called an inkling, with special powers. As in normal shooters, you have a gun, some grenades, and various ways to take down your enemy. There are different guns that are great in different scenarios, from high powered assault rifles to long range snipers. That’s about where the comparisons stop when it comes to every other shooter out there. The HUGE difference maker and home-run hitter when it comes to gameplay and execution, is the INK. Each team has a different color ink to work with. It might be green vs pink. It might be blue vs yellow. In the various game modes, the ink is everything. The main gamemode is called turf war. It’s a quick three minute battle where the objective is to cover the map with as much of your color ink is possible. At the end the score is tallied up and whichever team has more ink percentage wins. The stage starts out completely ink free; when you shoot ink from your fun onto the floor it covers that area in your ink. If it stays there the whole game, that would go towards the teams final ink tally at the end. However the other team can just as easily spray their own ink right on top of yours and take over the area. It’s a constant battle for dominance. Of course you can also take out the enemy with your ink guns as well. Another game mode is like king of the hill, called Splatzone, but with an awesome twist. Instead of gaining points by standing in the area and fending off the enemy, you gain points by making sure the whole area is dominated by your teams color. There’s a lot more strategy involved than the average king game, because you don’t need to stay in the area at all times, you can leave the spot and kill bad guys or flank around, as long as you keep an eye on that Splatzone. Both of these game modes with the ink being the center of it all is so much fun. In a world were deathmatch is king and almost every other game mode falls to the wayside, Splatoon’s ink is the reason why these new game modes are so much fun. On top of the gamemodes being “ink”centric, the ink provides so many new gameplay opportunities. The biggest thing revolves around your inkling being able to turn into a squid and swim through the ink. With a touch of a button, you can transform into a squid and fly through the ink at double the speed when compared to running. This is also how you reload/refill your weapons. You have an ink container on the back of your inkling. And you can see it drain away with every shot fired; you can then duck into your ink to refill your tank back up. This feels intuitive and natural very quickly, as does swimming around in the ink itself. The most important fact about all this ink diving is that you can only do so in your own team’s ink. Meaning if you are playing on the green team, you can only swim around and refill in the green ink. And if you walk around in the enemy’s ink, you will slowly take damage and you won’t be able to move at all, almost like you’re stuck in mud up to your knees. You also have a special meter that fills up whenever you cover areas in your ink. Once the special meter is filled, you can use your specials, which are similar to kill steaks. Some of them drop down a huge tornado like missile from the sky, others provide a safety bubble around your inkling for a few seconds, and others allow you to shoot a huge rocket from your back for maximum carnage. So the whole game revolves around the ink. Along with it being your weapon to splat and take down the enemy, it’s also used for the game modes themselves as the goal of the game and also it’s used for traversal, gameplay mechanics, and more. Some of the gameplay mechanics that can be done with the ink is truly revolutionary to the genre. When being attacked by an enemy, it’s not simply about going behind cover or firing away, the ink adds so much more. As soon as a gunfight starts, you can drop into your ink and flank around him before he even notices. Remember the ink on the ground would have to be your own color to do so. But even though you can go into the ink, the enemy can still hurt and kill you while you’re underneath, and there’s still a bump and ripple effect around the submerged inkling, so they can still see you with a quick eye. Flanking around some enemies before a gun fight even starts and catching them off guard is very satisfying. Of course camping is a huge annoyance in shooters, so you’d think ducking under the ink and hiding would be a major camping problem. But it’s not really at all. First off, you can’t shoot while underneath, so you are actually in a more dangerous spot since the enemy can still shoot and kill you while you are submerged. Secondly, since EVERY game mode and so many gameplay elements revolve around the ground being saturated with your own team’s ink, players are constantly shooting and covering the ground with their own ink. So even if you think hiding under the ink and waiting for them to pass is a safe thing to do, they can start shooting and killing you without them even noticing because they were just planning on taking over that area and turning it from green to pink for their own team’s sake. The map design is also quite open, and the range of the weapons is rather low, so camping is almost entirely nonexistent, which is awesome. Another amazing gameplay ability with the ink is climbing up walls. Covering the walls will not help your team gain points, only the ground counts. But it can help you climb up to new areas or perches to jump off of and catch the enemies off guard. The amount of tricks that you can learn and conquer over time is thrilling and really sets the game apart from the average shooter. The ink really makes this like nothing else I’ve ever played before. The controls themselves feel very nice, you can use the gyroscope to aim, but I recommend just going with the dual sticks like a normal shooter. There are a few cool abilities when it comes to the touchpad on the gamepad. If you have the inkstrike special, you use the screen to tap on the map where you want it to land. But the main reason you will use the touchpad is when you respawn. You can choose to just start right back from the original spawn when you die, or you can click on any teammate on the map and launch into the air and land right next to them. Be careful though, the location you will land appears on the enemies’ screen, so if it’s a really hot spot it might be an instant death. Powerups and special abilities can really ruin an online shooter. In destiny the game got really out of hand, as every five seconds it felt like I was getting killed by a massive sun orb or titan punch. In Splatoon, every special powerup can be extremely effective. But a skilled player still has the chance to see it coming and avoid it. It’s a fair balance for the most part. Progression, weapons, and perks is a very important part about any online shooter. Is there diversity? Is there balance? Is it fun to unlock new things? These are all questions that need to be answered with an emphatic yes. Every time you launch up Splatoon you spawn in Inktropolis, the game’s hub world. Inktropolis is awesome. It’s colorful, vibrant, and full of life. It feels like a real place and really sets the tone for the world the game takes place in. The hub world is filled with other Inklings of real people online. It’s very much like Destiny’s hub world, the Tower. Only difference is characters are not walking around in real time. It’s just there in game characters with their names, their gear, and a miiverse message. On the left hand side of the city there are a set of stores, where you can buy your gear and weapons. On the right hand side is where you’ll find the single player, the local multiplayer, and a black market dealer who can sell you rare stuff for a lot of cash. And straight ahead is where you can jump into online multiplayer. The stores on the left side are where you’ll find yourself running into as often as possible. There are four different stores, each one of them specializing in a different item. The shop keepers are full of character and impossible not to love. There’s a horseshoe crab helmet wearing salesman of guns, a big shrimp who sells shoes, a jellyfish who sells shirts, a girl who has sea anemone for hair with a clown fish living in it. Each character is funny and unique, for example the sea anemone girl is very shy and unsure of herself, meanwhile the clownfish on her head is often screaming at you and telling you to hurry up and pay. All of the buyable gear has unique look and style. On top of that they have abilities attached to them. Each hat, shoes, and shirt has random abilities and it’s up to the buyer to pick which one they like the best. There are abilities that range from giving your weapon a bit of extra damage power to making your movement while swimming under ink invisible. Picking those perks that best utilize your play style is crucial. None of them seem overpowered; they just give small advantages in different styles of play. One example of these abilities is one that allows you to use your specials longer. So when you cover enough area with ink and you gain your ink bazooka, you can use it for an extra few seconds thanks to the extra ability in your gear. However if you have the inkstrike, which is an airstrike of ink, it’s a onetime use special. So there’s no point in having the ability of being able to use your specials for longer. So it’s your job to switch out the gear to better help you with whatever play-style you choose. The weapons are done smartly as well. At every level you unlock a new gun pack that you can choose to buy with your coins that you unlock in multiplayer. Some weapons are certainly better at different jobs than others. There’s SMG style guns, mid range assault rifle style guns, snipers, and rollers (which I’ll get to in a second). The sub-weapons, your grenade and mines, are good for different styles of warfare as well. And of course those powerful specials can be deadly. Here’s the very smart thing Nintendo did with the weapons. Instead of allowing you to pick individual guns, subs, and specials, you have to pick packages. Meaning you can’t just pick that best SMG mixed with that best grenade mixed with that best special. Otherwise quickly the game would become top heavy with the “best” weapons. Think how Call of Duty games often have three or four guns that everyone always uses with the same perks that everyone uses with the same equipment and same kill streaks. ACR, Stopping Power, Claymores, Scavenger Pro, Harrier, Attack Choppper, Nuke from Modern Warfare 2 anyone? (If that went over your head, ignore it.) The way Splatoon handles the weapons is in packages, and each gun has a couple different package options. For example if you like the .52 Gal gun, you have two different options. You can pick the one that comes with the Splash Wall sub and Killer Wall special. Or you can pick the package with the Seeker sub and the InkStrike special. If you like the Aerospray gun, you can have the package with the Seeker sub and Inkzooka special. Or the Aerospray with the Ink Mine sub and Ink Strike special. These different packages create different play-styles and allow for fair balanced gameplay. To jump back to the Roller class I talked about earlier, there is a style of weapon that is called a Roller and these can be very deadly but also can be easy targets. Imagine when you are painting a wall; you use big rollers to spread paint across large areas, a lot quicker than a paint brush. This is the same principle in Splatoon. Roller weapons can be used to spread ink across large areas very quickly, and they can get kills by running over other players like a cement roller. Single player is surprisingly fun. The story is very simple and nothing special. But the gameplay takes everything from the multiplayer and adds so much more. The bad guys are silly, creative, and a lot of fun to kill. When you jump into single player, there are hub worlds filled with four to six levels and they climax with a very Nintendoy boss battle. The single player also unlocks weapons for multiplayer, including the very fun Aerospray. The graphics in Splatoon are very very pretty. Colors are vibrant and bright. Animations are slick and cartoony. In single player the enemies are lively and fun. The gear, weapons, and maps all have unique and fun looks. The music is very hit and miss. Splatoon does a great job of creating its own unique sound, but some of the songs lean more towards annoying than. The more laid back and quiet songs in the city, shops, and hub areas are all awesome. But some of the music during gameplay is pretty bad and others are amusing and memorable. For the most part this review has been filled with all the good of Splatoon. But there are definitely some major problems, luckily they can be fixed and it seems like Nintendo is working on them. First off, there are only 6 maps. 6 maps for a launch of a multiplayer focused game is kind of absurd. Also there are only three game-modes in multiplayer. Add on the single player and it’s not half bad, but it definitely needs more. Thankfully Nintendo is on top of that. Already, less than a week after launch they’ve updated the game twice, one new map and two new weapons. At the moment, the top level is 20, which is doable in a decent amount of time. There is no prestige. I’m definitely hoping Nintendo ups the top level or adds a prestige. Probably the most baffling design choice is that there is no voice chat. A 4v4 online shooter without voice chat is unheard of today. But Nintendo us stuck in its ways. Luckily, in the short matches and tight gameplay, it isn’t missed quite as much as you’d think. Nintendo has promised to continue to support Splatoon with new maps, weapons, game-modes and more in the near future and far far beyond as well. If Nintendo can support this game more along the lines of PC Arena shooter over the next two years then this game has the real chance to grow into a classic. The love and support for Splatoon is very real. Nintendo fans and gamers a plenty are all about this game. Its new unique gameplay is exactly what the genre needs. Nintendo has created something truly special in Splatoon. The game is balanced, fun, and challenging. All the crazy gameplay, movements, and gunplay allowed through the ink is unlike anything I’ve ever played before. Nintendo needs this game to be a big hit, and I think it has a very strong chance to be. It’s not perfect, but the problems are not design problems, they are fixable issues that can be addressed in time. The Splatoon community will play this game for a very long time as long as the Big N continues to support it.